Propane / Commercial | Griffin Oil and Propane | Suffok Energies, Inc.
Propane is one of the leaders in commercial and industrial energy applications because of its advantages compared to other fuels. Lower Emissions, Productivity, and Reliability gives propane major advantages in the commercial and industrial markets, including Forklifts, Lawnmowers, and On Road Vehicles. Propane powered equipment reduces carbon emissions up to 25% depending on application. Propane site to source emissions frequently are less when compared to electricity and other fuels; giving it a big advantage in the warehouse and environmentally conscious landscape markets. Propane powered equipment preforms more quickly and allows for less downtime when compared to electrical alternatives. Simple tank fills or swap outs equates to less time your equipment is setting idle and charging. More than 70% of propane production comes domestically from Natural Gas. The U.S. domestically produces more than enough propane to exceed customer demand. Refueling infrastructure as well as a large OEM service network allow propane equipment to be refilled easily and stay moving. 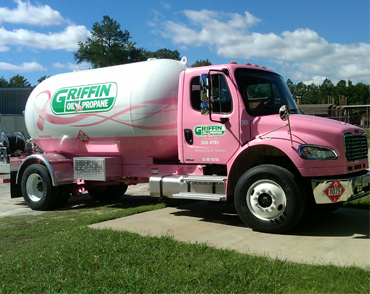 Griffin Oil & Propane offers provides reliable services to Warehouses, Restaurant’s, and many other Hospitality services. Programs can be customized to allow for Cylinder Exchange or On-Site Fueling as well as courtesy staff training.